GearfireHub - Gearfire Blog - Kids and Guns - Why? When? How? How Much? Disclaimer: The opinions stated in this article are the opinions of one firearms instructor. They are not reflective of any official position of the NRA or other instructors. Only you can decide what is right for your family. It is your decision and your responsibility. This article is merely a tool to help you as you consider some aspects of that decision. Kids and guns - talk about a touchy subject. We hear far too many stories about accidental shootings involving kids. Not to mention school shootings. All that makes this a very emotional topic, and gives those who vilify guns plenty of ammo to use against gun owners. It's important to consider carefully how you will keep your family safe, not only with the firearms you own, but also from the firearms you own. Of course, part of keeping your family safe is deciding how and when you will store and secure your firearms. You should have a safe place to lock away your firearms and ammunition when they aren't in use. When they are in use, firearms should be secured either on your person, or in your direct control. In use: A firearm is "in use" at any time that you are depending on that firearm to defend yourself, your family, or others. But today, I want to talk about the more complicated decisions that you need to make if you have a child. Decisions about when to introduce your child to firearms, how to teach him/her as safely and effectively as possible, and how much access to allow them to your firearms. All these decisions are not one time things, nor are they one size fits all. They need to be re-evaluated regularly as your child grows. The anti-gun crowd says that there is one answer to the tragedies we hear in the news. No guns mean no gun related deaths. Unfortunately, it just isn't that simple. If you, like me, believe that it's your responsibility to defend your family from potential threats and that you need a firearm to do that, then there are going to be guns in your house. Now, how do you keep your kids from becoming a headline? While the last one is something that is a health and family issue that I am not qualified to comment on, the other two are things that all families with firearms must consider. I believe that the biggest deterrent to childhood curiosity is controlled access to the items that they are curious about. Letting a child shoot and then see the vivid visual of what a gun can do is a wonderful teaching tool. When you're playing with Nerf or water guns, talk about the differences between these toys and real guns. Talk about realistic looking toy guns and the fact that it can be hard to tell the difference, so if they see a gun they should never assume that it's a toy. Consider your child's maturity level and consider whether realistic video games and violent movies are appropriate. If you do allow these, then be sure to have discussions with your children about them. Always keep the lines of communication open. Only you can judge how well your child differentiates between reality and fantasy. Be very sure that you know. And if you have any concerns, those concerns must be considered when making decisions about how much access to allow to firearms. There is no magic age when a child is suddenly ready to handle firearms appropriately. Kids mature on their own schedule. And to be honest I've seen grown men that I didn't feel were mature enough to handle firearms! ;) Only you can know what your child can handle. My daughter didn't show an interest until she was an adult. I made sure that she knew that I'd be happy to teach her anytime she was ready. She just wasn't interested, and I didn't push. I don't believe that anyone at any age should be pushed into using firearms. So much about being able to defend yourself depends on mindset. The first concern when teaching anyone to shoot is safety. Teach the safety rules first and reinforce them often. Allow your child to see the damage done to your target. It can make a big impact to see what happens to a jug of water or a watermelon when it's shot. Teach your child routines. Even if they aren't old enough to do the "right things" for themselves, they should see you doing it and explaining what you are doing every time. Wear your ear and eye protection every time you shoot. Check to see that the firearm is unloaded - magazine out, chamber empty - before picking it up. Load the firearm being careful to keep the muzzle pointed in a safe direction. Ask "What is your target?" and "Is anything behind your target?" to remind them to be aware of those things every time. Teach basic grip/stance/breath control from the beginning. Unload the firearm before laying it down. Teach these things from the beginning, and you won't have to break bad habits later. If you'd like, I can help you with that. 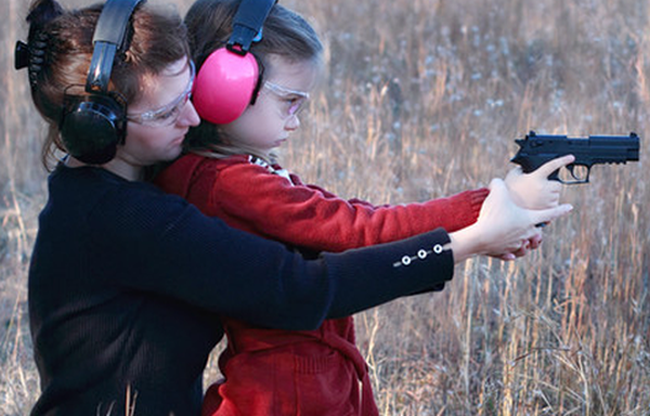 When you book a class for your child, a parent can attend and shoot for free. I have experience teaching kids - at church, as a substitute teacher, as well as teaching kids to shoot. I can make the class fun, and still teach all the basics. You'll need to reinforce them at home later, but it can be a great way to get started. For very young children, you might want to start with Eddie Eagle. There is a kids' site, as well as a parents' site with tools from the NRA to help teach kids what to do if they see a gun and an adult is not present. When is it time to move from supervised shooting, to allowing your child to stay home alone with access to firearms for his or her own self defense? I don't feel comfortable leaving my son home alone without a gun. If I feel the need to have the ability to protect myself, how can I leave him with no way to protect himself, right? His demonstrated firearms safety. He is the one who will point out when someone else breaks a rule. He is very conscious of muzzle direction, finger off the trigger, etc at all times. His emotional stability. This is a moving target. As mature and responsible as he is, he is still a teenager. I am blessed that we are very close. Rarely, when I have any concerns, we just don't leave him home alone. If something is upsetting him, if I feel that he's hiding something from me, if he's been angry with me I'm more cautious. I trust him, but I realize that teenagers aren't always completely rational when they are emotional. I don't believe that he'd ever do anything so stupid, but I choose to err on the side of caution. His mindset. This is the big question everyone should consider before keeping a gun for protection. Are you willing to shoot? Are you prepared to fight? Can you really take a life if it means saving your own? You need to ask these questions and be certain of the answers before leaving your child home alone with a firearm. Willingness to train - and keep training. Not just going out to shoot. Do you have intruder drills? Is there a safe spot with cover and a working phone for him to retreat to? How will he be sure that what he heard is a bad guy and not us or someone else he knows? To me, this decision goes hand in hand with the decision to trust your child to stay home alone or to drive a car. If you don't trust your child with a gun, do you trust him not to start a fire, not to have people over when you're not home, not to drink and drive or text and drive? If you trusts your child with these responsibilities, then consider whether you might trust him with the responsibility for his own protection. It could just save his life!